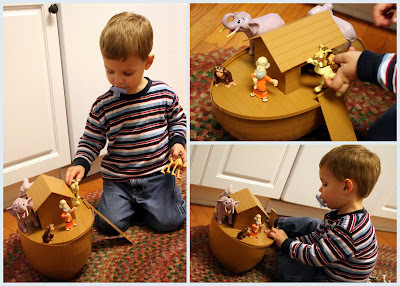 Recently One 2 Believe sent me a great BIG play set of Noah's Ark to review (this is the same company that also makes a super-cute nativity set). It has been a toy that has been well-loved (and much fought over...ahem) in our house. The moment it came out of the box, our kids had so much fun reenacting the story of Noah. One 2 Believe took the 'big' ark very seriously - it's over a foot long and 10 inches tall. The set comes with Noah, the ark, and 14 animals: elephants, lions, ostriches, monkeys, donkeys, camels, and rams - a male and female of each creature. The top comes off the ark so that animals all store inside when the kids aren't playing with it. The set also comes with a little story book and also a list of "Spiritual Stepping Stones" that help a parent mark their child's spiritual development. We've had animals parading around our house for weeks and last night had far too much fun playing with it in the tub. It FLOATS too! Animals were lining up along the edge of the tub, waiting to jump on the ark and be rescued from the deep bubbly water. One 2 Believe offers a range of other great Bible inspired toys, including Proverbs 31 dolls, Spirit Warrior action figures, and other Bible characters. 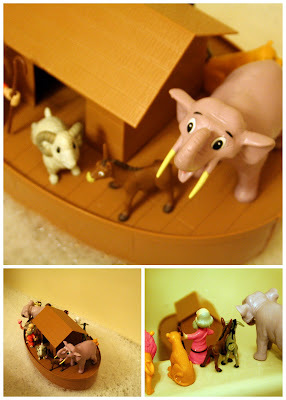 You can order the Noah's Ark set directly from the one2believe website ($29.99).